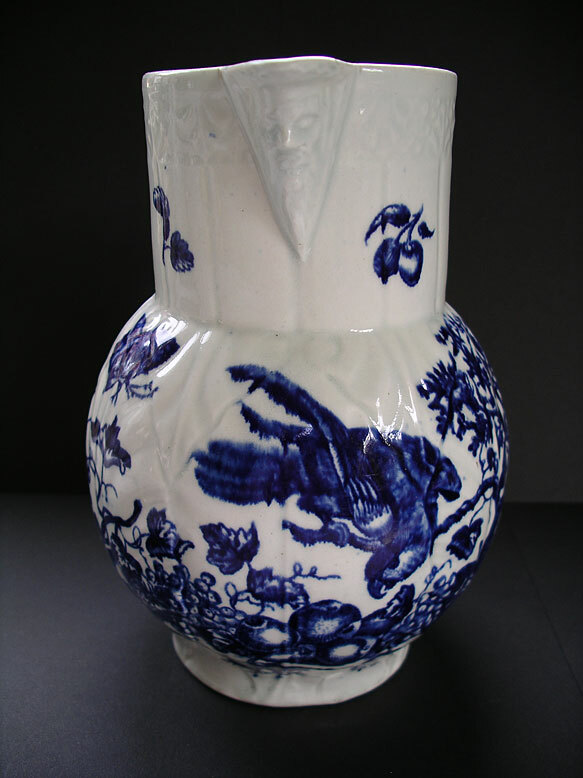 "An attractive Worcester porcelain cabbage moulded mask jug printed in underglaze blue with the Parrot Pecking Fruit pattern (second version). 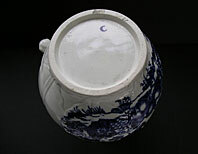 This pattern is usually found on mugs and is quite rare on mask jugs which include additional subsidiary printed decoration only found on larger pieces. Note the moth like flying insect and sprays of currants, goosberries, a cherry and a marrow. 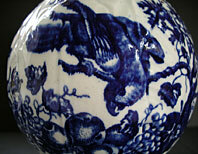 They are simply fabulous examples of blue and white underglaze transferware." Antiques Expert Hamilton Bear. References: The Parrot Pecking Fruit print is based on an earlier simpler overglaze example by Robert Hancock taken from The Ladies' Amusement. The subsidiary sprays on this example are probably also taken from this source. Dimensions: height 175 mm max. Condition: In good general attractive display condition for such a large early piece. There has been some old professional restoration before we obtained it. 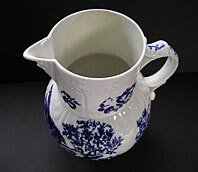 A faint hairline running down one side of the jug has been oversprayed on the inside to hold and disguise which is fairly typical on many of these jugs. This can been seen as a cream- yellowed area on the inside from the neck. To the outside the hairline is quite difficult to spot and there is no significant discolouration so the effected side displays well. Still a good display and reference piece.